Two recent events have me led me to write this letter. This letter is about people judging other people. Whether it's neighborhood gossip or something going on within one's family, we all do it from time to time. As I previously stated, there are two recent events that got me thinking about judging others. The first incident took place one month ago. On that particular day, I had attended a birthday party for one of my cousins'. After the birthday party, several family members - including me - went back to the house of one of my cousins'. We were sitting around, talking and catching up when one of my uncles asked me how my mother was doing. I responded by stating that the last time I spoke with my mother she was okay. This uncle then continued to press the issue by inquiring about how long ago it was since I last spoke with my mother. When I stated it had been several months since I last spoke with her, my uncle stated that my mother will always be my mother. I responded by stating that a lot had happened since he last saw my mother - 8 years prior - and let's agree to disagree. The second event that moved me to write this letter has to do with a voicemail that was left on my mobile yesterday. The message was from a woman I knew through the religion this woman and her husband shared with my mother; a religion I haven't identified with for a decade. In the message, the woman stated she moved in with her mother and she wanted to know how my mother and I are doing. The questions that kept running through my mind were, 'What does she want?' and 'Haven't they (the people in that religion) caused enough trouble?' These two questions are valid because for all the preaching they do, knocking on people's doors on a Saturday morning - claiming to have brotherly love & the 'true' religion - their actions prove them to be judgmental hypocrites. Rarely did any of these 'brothers' or 'sisters' do something as simple as calling on the phone to say 'hi' or send a 'Get Well' card. But, if they wanted to ask you to do something for them, they could pick up the phone and call. In the winter of 2000, both of my parent's had an accident in which they were both injured; they also cope with residual effects. My mother injured her lower back while my father's injury was in the cervical region of his spine. Beginning in the winter of 2000, I found myself having to juggle work - both inside and outside of the house - while taking my mother for surgeries & medical procedures, follow-up doctors appointments and physical therapy. I did the same for my father, only not to the extent I did for my mother because my father has several siblings to help. During this time I also took evening class at an area college. I managed to meet these obligations by myself, which wasn't easy; being an only child; my mother is also an only child. My parent's divorced by the time I turned 1-year-old; neither of my parent's has re-married, so there's no step-parent to help out. There were times when the stress of trying to do it all myself got to be too much. During this time I had an increase in the frequency of my migraine headaches and my GERD went from bad to worse. You could set your clock by me because I would be unceremoniously awakened out of a sound sleep each morning, around 4 a.m. with severe abdominal pain. The tests my physician ordered came back negative, meaning there wasn't anything wrong. But, things would get worse for me before they would get better. In 2006, I was involved in a motor vehicle accident that exacerbated the back injury I sustained in 2005. In 2013, I had surgery but still cope with chronic, intractable lower back pain and sciatica. In 2008, I began to experience chest pain, palpitations and what felt like a skipped heartbeat. All the tests performed were negative; nothing wrong except my heartrate is fast and my potassium level is slightly below normal range. In 2009, I began to experience abnormal bleeding on a daily basis for nearly one month, along with intense lower abdominal pain and discomfort. I consulted a GYN oncologist who was proactive in his approach and treatment of my symptoms. I did not have cancer, but I would have to undergo surgery. The surgery combined with a different medication was successful. Earlier I mentioned that things would get worse before they got better. During this time when I was dealing with issues related to my personal health, I was also going through a lot emotionally. Much of what I went through emotionally was due to the fact that the environment in the household was toxic. When a person is sick and/or injured they need emotional support, compassion and understanding. There wasn't any compassion towards me, only the frequent expletive-filled tirades of my mother which usually took place early in the morning or late at night. The walls of that house became a prison to me and I didn't have any hope. Many a night I cried myself to sleep. One person said to me the reason I was having problems with my health was because I wasn't coming to the religious organization's weekly services. This is part of the danger of judging others. We don't know what someone is going through in their lives, not unless we stop and make the time to hear them out. No one took the time to listen to what I was going through. I was so exhausted physically and emotionally. For so many years I carried a heavy load, by myself. 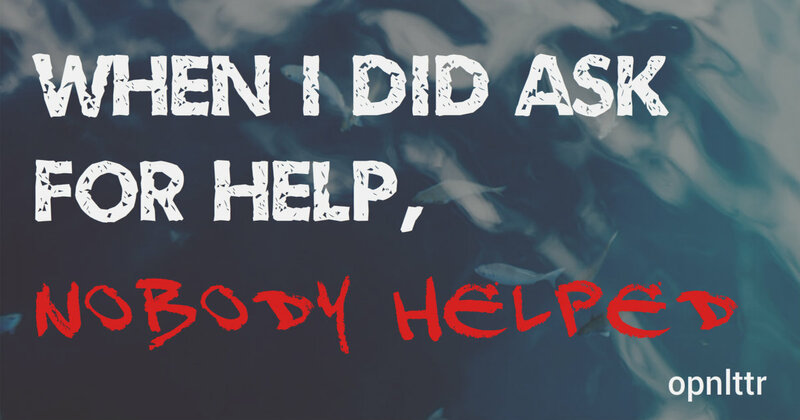 I wasn't trying to be a superwoman, it's that when I did ask for help, nobody helped. Until a person hears the whole story they don't know what is going on. They shouldn't judge someone based upon incomplete facts, gossip or perceptions.